Your Kyoto afternoon adventure begins at Daimaru Kyoto department store, where you’ll meet your guide and head out on a 2-hour walking tour. At the famous Nishiki Food Market, your guide will introduce you to the many ingredients that may be used in your Japanese cooking class later in the day. Learn about local produce and spices, and enjoy being part of Kyoto’s bustling food scene. Next, travel through the back streets and shop-lined lanes of Kyoto to a former sake brewery, now a museum, where you can enjoy a sake tasting as you learn how this iconic Japanese beverage is produced (if the museum is closed on the day you visit, you will receive an admission ticket to use at a later date). Then make your way to a machiya, a traditional wooden townhouse typical of Kyoto, for your cooking class.Your cooking class lasts approximately 1.5 hours; when it’s over, you’ll know how to prepare a classic Japanese dinner to wow your friends back home. Learn how to roll your own sushi, make miso soup, put together a cooked salad and pick out seasonal fruit for dessert. After sitting down to enjoy your meal, you have the rest of the evening free to explore Kyoto on your own. If you want to return to your hotel after the class, your guide can help you find transportation. 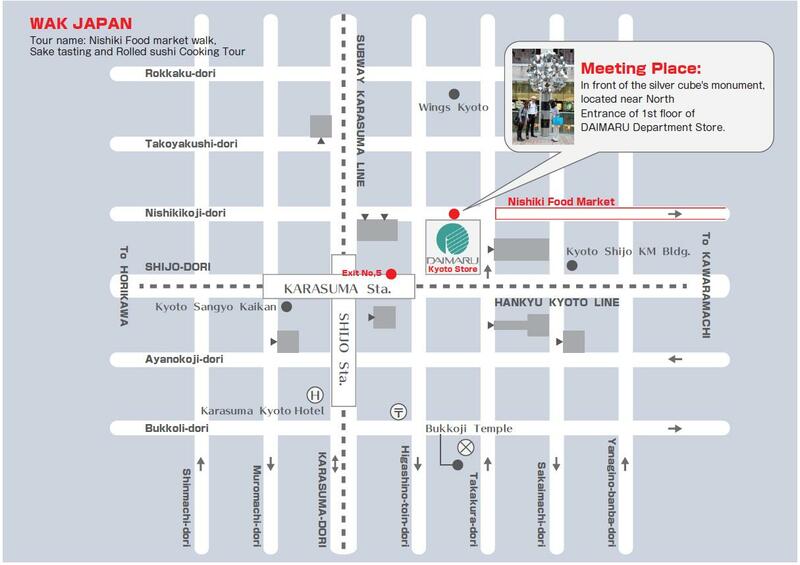 Note: Click the ‘View additional info’ link below to see a map of the meeting location.